A specialized charm designed to create a fully grown clone of a Nightshade plant. Using freshly picked Cavern Fungus and a dusting of Minerals, this charm instantly grows an additional Nightshade plant when one is found. Provides a boost to Nightshade loot drops. If a mouse drops Nightshade while this charm is equipped, an extra Nightshade plant will instantly grow nearby, ready to be plucked. The Nightshade Farming Charm can be purchased at any of the Hollow Heights Charm Shoppes in exchange for 400 gold, 5 Cavern Fungi and 2 Minerals. It can also be traded at the Marketplace. Hunters are able to transfer their supplies of the Nightshade Farming Charm using the Give To Friends option. My Nightshade Farming Charm bloomed an additional 1 Nightshade! Super Nightshade Farming Charm - Mice throughout the Kingdom will drop a Nightshade as loot. 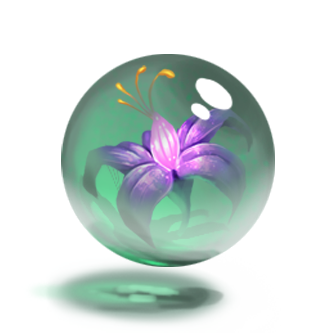 12 May 2015: The Nightshade Farming Charm was introduced with the release of the Fungal Cavern. This page was last edited on 17 April 2018, at 18:03.